On August 15, 2013 the Federal Housing Administration moved to relax its guidelines for borrowers who 'experienced periods of financial difficulty due to extenuating circumstances'. Dubbed the 'Back to Work - Extenuating Circumstances Program', the FHA removed the familiar waiting periods that typically followed a derogatory credit event. The FHA realizes that, sometimes, credit events may be beyond your control, and that credit histories don't always reflect a person's true ability or willingness to pay on a mortgage. 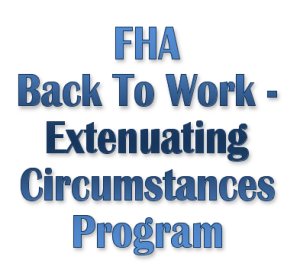 Call me today to learn more about the FHA's Back to Work - Extenuating Circumstances program.